I've heard people that were called to be apostles say: "I don't know how to be an apostle", or "I don't know how to be a prophet." I told them to cheer up, Christ is quite capable of being either one without their help. All any of us need to do is die to our desires and our agendas, and believe me, He knows how to be who He is! You can't put something in a vessel until it is emptied out, however. The less there is of us, the more there can be of Him. I could say it this way: the more there is of us, the more His life through us is diluted and tainted. The church wants to act and be so spiritual, but we are just people, He's the spiritual one. 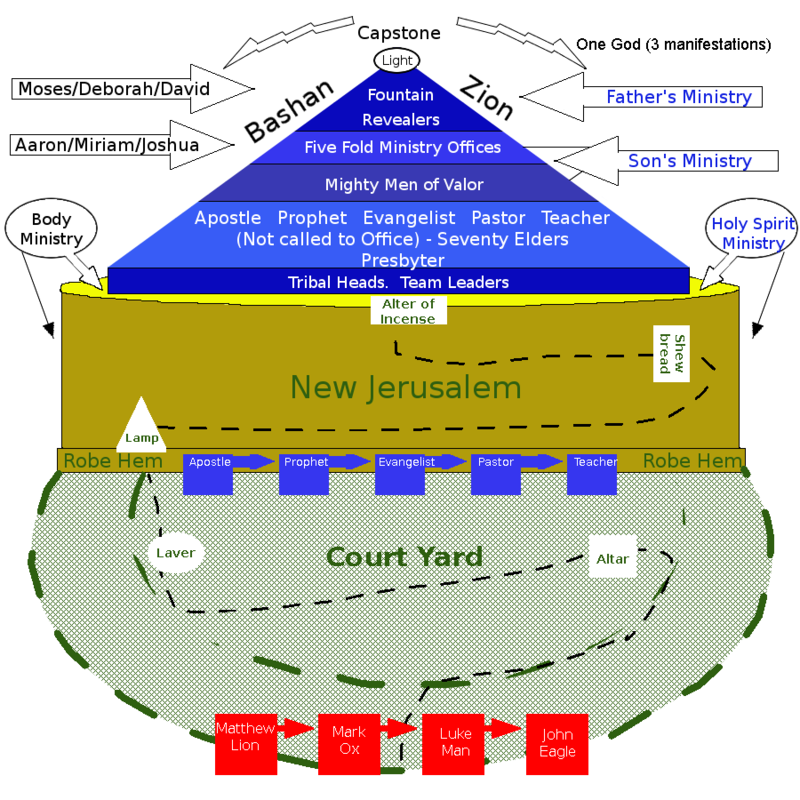 Let us look at the diagram of the spiritual mountain and city. If the people on the gates of the courtyard that are to be calling in the sheep out of the world decide they want to be revealers, there will be no anointing on their lives to reveal the truth as God opens the contents of the seals. And if the revealer was to minister at the gates, things much too difficult and deep for new sheep to understand would be taught, and they would probably return to the world. The church has done a disservice to God's people in that they criticize the prophets, for instance, for not going door to door looking for the lost, when it just isn't what God does in them. A prophet can preach till he is blue in the face and not lead as many to the kingdom as an evangelist can by saying "good evening"! It's the anointing, or the approval of God, on and in the vessel that is doing the job that Christ wants done through them. Yet the prophet is criticized because the church says all people should save the lost. This is partially a true statement. We should all, if the opportunity arises and God draws someone to us, lead people to the Lord. This includes office holders and body members. But what I am trying to say is, there is a craving to save the lost in those called to be evangelists. Just like there's an undying love for people and a desire to protect them in the pastor. An apostle may really feel the need to start a work in a remote area where people are showing interest in truth and his mind is preoccupied with making the desires of Christ within happen. Or the same Jesus that warned the Pharisees and Sadducees 2000 years ago to stop teaching things that just tickled the ears of the sheep warns through the prophetic today. God is still telling us His desires for the church and assuring us of His love for the obedient and contrite of heart and He does this also through that part of His body we know as prophetic. As I said, anyone in a pinch, so to speak, can do anything, but nevertheless, the anointing to do specific things is on us all. We must find out what it is that we are to do, the prophets can help us in this, the apostles can provide a place to learn, the teachers can ground us in sound doctrine and the pastor can guard us as we learn. The revealer releases the truth that must be taught to the above to prepare us. We need everyone to do their part! But the encouragement to those that do not know their place as yet and feel left out is, remember we must first be nobodies so He can be somebody. We must also be careful about criticizing God's people for not being or doing what we think they should, as we may be at odds with the Christ in them! So above all, we have to see the Jesus in one another. If we do, it will make it a lot easier to be respectful of God's people and to love them as the chosen of God and it will help us put the needs of others above ourselves as well. Another thing, if we can learn to rely on the Jesus in others, we will avoid the natural tendencies to look at people as idols, make heroes of them, and put our trust in humanity, bringing the curse of Jeremiah 17:5 on ourselves. If we will first allow God to place them where He wants them in the body, then we can look at the office and know that it is Jesus fulfilling that office and just love the person for their obedience to Him. But our trust will truly be in Christ. Love man and God, but trust only God. Something prepared, any apparatus (as an implement), utensil, dress, weapon, armor, bag, instrument, jewel that is made of (one from another), pot, stuff, whatsoever. to end, to cease, be finished, perish, to complete, prepare, consume, be end of, expire, finish, bring to pass, wholly reap, make clean. In Greek the meaning is interesting. It means: a vessel, implement, apparatus (literally or figuratively), specially a wife as contributing to the usefulness of her husband, goods, stuff. I don't see anything here that suggests we are one greater than the other, do you? In fact, let's look at 2 Cor. 4:7-11. 11 For we who live are always delivered to death for Jesus' sake, that the life of Jesus also may be manifested in our mortal flesh. It's Christ in us that is important, and we must help each other to let Him manifest to His fullest through us. He chooses whom He pleases: see Acts 9:15. Those He calls must allow themselves to be purified for the Master's use in His household. What kind of vessel are we? II Timothy tells us there are vessels of honor and vessels of dishonor. I pray we will be the vessels of honor. If we don't see that it is Christ in us that is the hope of glory, then we will be pleased when we do well and pride will pat our heads. If we do bad, rejection will crush our spirits and hearts. If it's really Christ in us, and we are but vessels, then we can honestly say: "If I don't take the glory, then I don't take the blame. I'm just a vessel!"